There’s a fine video criticism of Avatar making the rounds, thanks in part to a boost from the Huffington Post. The author is Jay Bauman at redlettermedia.com, and he absolutely nails an important point: “The Na’vi were a little too perfect and harmonious for a primitive culture, and the military were a little too simplistic and destructive for an advanced culture.” He’s certainly right on the first point–and “little too” actually means “way too”–and he is correct on the second as well, once you distinguish between the destructive potential and the actual conduct of the U.S. military in the field, and remember that the distinction is meaningless to those who actually get nailed by modern firepower. 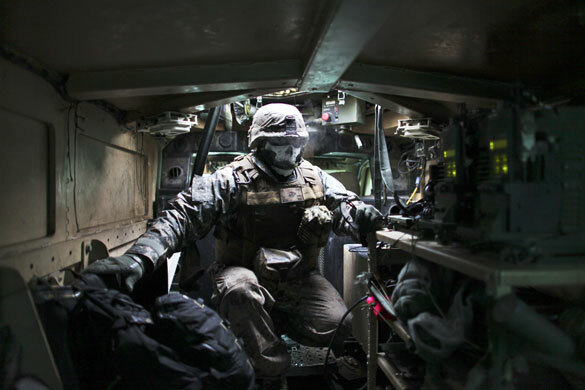 The caption for this photograph tells us that a Marine turret gunner is inside an armoured vehicle in the Pech Valley, Afghanistan. OK, he’s a turret gunner, and he also is War incarnate. The death’s head, his physical bulk poised for action even within an enclosed space, his uniform that seems like some infernal skin, and his effortless ease and conformity with the metal and machines all around him all communicate one thing: this guy is capable of wreaking total violence on anything that gets in his way. This photo was on the front page of the New York Times yesterday, and so one can easily read it as an attempt to help the U.S. put its best face forward. It is as accurate and as representative as the one above, however. 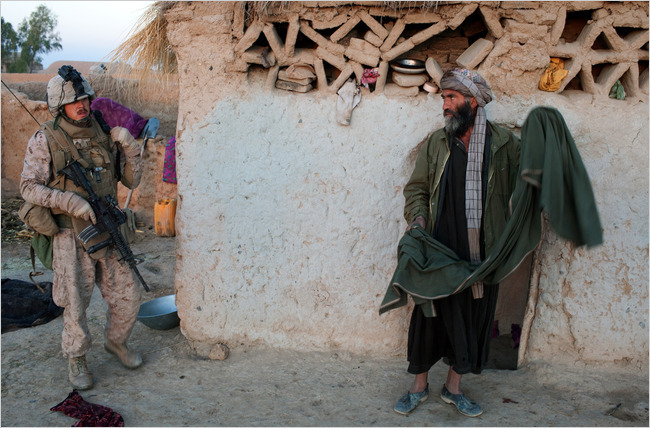 Here the Marines are on a sweep through Helmand province, which has lead to this interaction between two individuals, each of whom is taking care to show that he is not as dangerous as he might be. The photo positions the two men as roughly equals, and while it emphasizes the gulf between them, that space does not appear to be a battle space. The gulf symbolized by the blank wall could include cultural differences, political objectives, or social trust, but in any case it seems clear that the work to be done has to involve communicating rather than firing the Marine’s weapon. In fact, it becomes easy to see each of them in civilian terms, as if the one on the right were a local businessman (which he may be) and the one on the left were a small town bureaucrat (which, in a way, he is). Part of the current struggle regarding the imperial project is between these two alternatives of overwhelming, indiscriminate violence and tactical negotiations that can translate “politics by other means” into politics. Photojournalism is needed to show us the two faces of war–and not either one alone. It is up to others, however, to decide whether the balance will tip one way or the other. Photographs by Brennan Linsley/Associated Press and Tyler Hicks/The New York Times. The Times story is here, along with a slide show of photographs by Tyler Hicks. Next Post →Ready to Do Violence: War Games or Simply Modern Warfare? We’ve come a long way if we’re being asked to see the bottom photograph as benign in any way. If someone strolled through my village fully armed and with their finger on the trigger they definitely wouldn’t be mistaken for a local bureaucrat. Brenda: I didn’t say they were good choices, and I tried to be clear about the fact that it’s still a military occupation that is part of an imperial project, and I’ve posted many times about (and against) both the occupation of Iraq (e..g, http://www.nocaptionneeded.com/?p=312) and the normalization of war. (OK, so I’m being a bit defensive here.) Nonetheless, I think that it does no one any good if the left has a simplistic view of the military, just as it doesn’t help when the public buys another, equally simplistic view. Also note that I found the first photo at the Guardian; I think it is not likely to have appeared in many US papers. The second came from the New York Times, which has run a series of articles on the military acquiring skills in small-scale negotiations. If readers see predominately one kind of image or the other, the result is likely to be polarization which can aid the continuation of war. That said, thanks for your comment, as your point needs to me made again and again.